This section is responsible for the re-development business to review the assets owned by Toei and use them more effectively. The section is responsible for building, operating, and managing all commercial facilities, such as Platz Oizumi, a large shopping center. It has also opened many cinema-complex facilities including E-ma (Umeda Burg 7), a new-type building containing a cinema complex, and multi-brand stores in Umeda, Osaka, and Shinjuku 3-chome East Building (Wald 9, Shinjuku Marui Annex)for a cinema complex, commercial stores, and area electric-power substation. 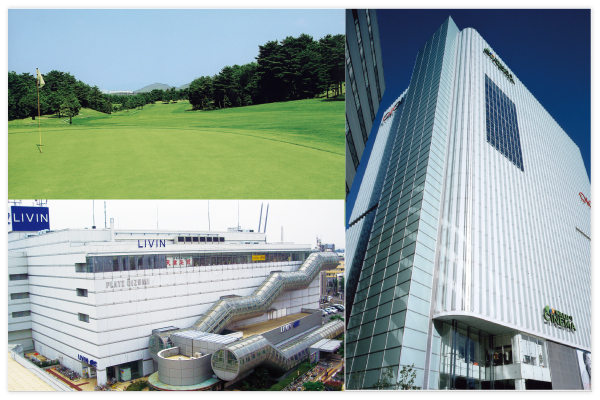 The section also manages a golf course (Hiroshima Toei Country Club) and other businesses. Additionally, it operates and manages real-estate leasing facilities we own, including many commercial buildings in major cities nationwide redeveloped from movie theaters, such as Shibuya Toei Plaza, as well as office buildings and rental apartment buildings. We directly operate three hotels at present in major cities nationwide. They are two city hotels: Niigata Toei Hotel, Fukuoka Toei Hotel, and one hot-spring resort hotel, Yuzawa Toei Hotel. All hotels are closely located to train stations and have banquet halls that can be used for parties and conferences and restaurants with a wide variety of cuisines. We look forward to seeing you with our careful and warm services. We also focus on marketing activities to acquire new customers and secure existing customers by opening the hotel chain’s reservation website.